Colour woodblock print, published for the newspaper Yûbin hôchi shinbun. This print published in 1875. Signed Taiso Yoshitoshi, red artist’s seal. Fine impression and colour, very good condition; full sheet. Vertical ôban, 368 x 250 mm. Yoshitoshi was one of the last great masters, and one of the great innovative and creative geniuses, of the Japanese woodblock print. At the age of eleven, he was enrolled as a student of the school of Kuniyoshi. 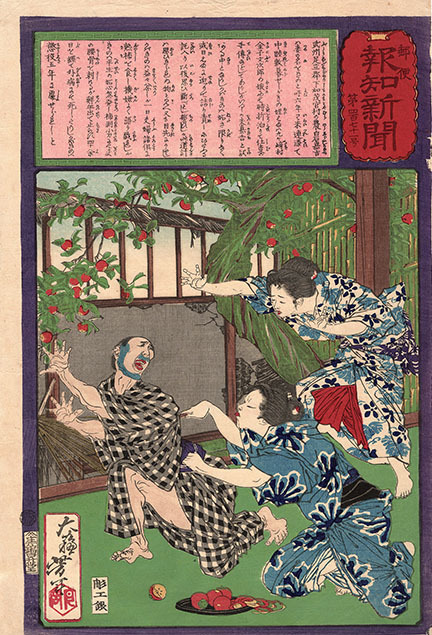 His early work is full of extremely graphic violence and death, perhaps mirroring the lawlessness and violence of the Japan around him, which was simultaneously going through the breakdown of the feudal system imposed by the Tokugawa shoguns, as well as the impact of the West. 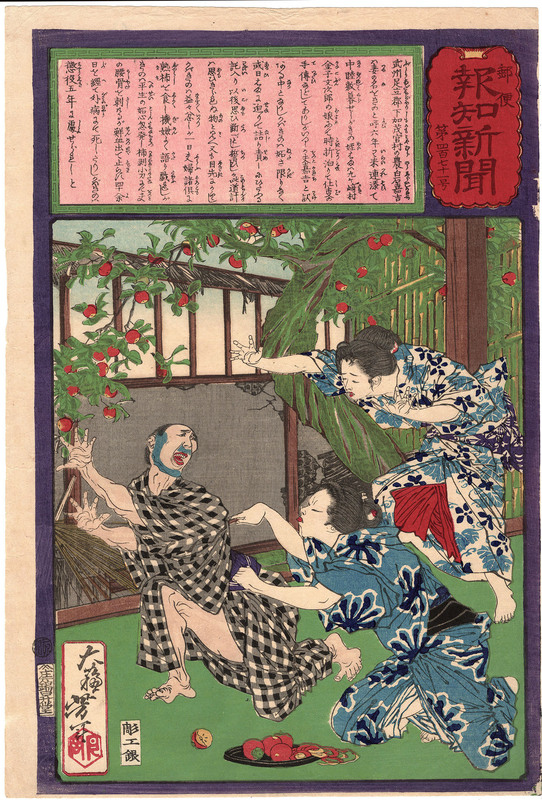 By 1871, Yoshitoshi became severely depressed. Unable to work, he hardly produced any prints for two years. In 1873 he recovered from his depressions and changed his name to Taiso, which means great resurrection. In 1882 he was employed by a newspaper. This gave him a steady income and marked the end of years of poverty. His last years were among his most productive, not only in terms of quantity, but also in terms of artistic quality. In 1885 the first designs of One Hundred Aspects of the Moon were published. This series was extremely popular. In 1888 the series 32 Aspects of Customs and Manners was published, a series of women prints. In 1889 a new series with ghost subjects came on the market: New Form of 36 Ghosts. The symptoms of mental illness became more and more frequent. 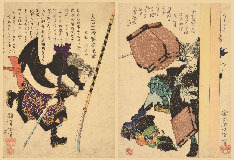 Nevertheless Yoshitoshi continued to work. He died in 1892 from a cerebral hemorrhage at the age of 53.